Schwinn bikes on parade at Kelley Park. 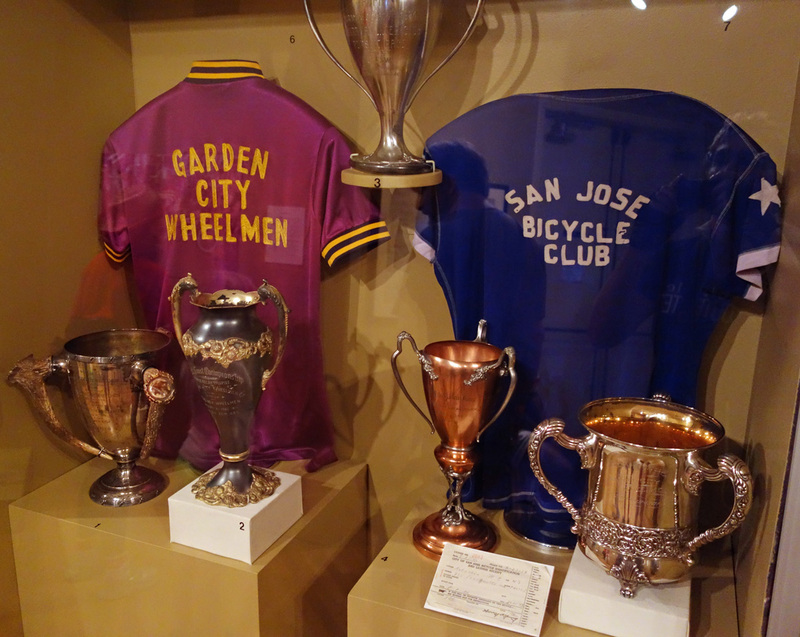 On Sunday, San Jose’s Kelley Park saw a bike gathering of epic proportions as two bike events meshed into one: Shiny Side Up Bicycle Day and the exhibit “Bikes: Passion, Innovation & Politics Since 1880” opened inside the Pacific Hotel’s Arbuckle Gallery. I’ll get to the history part in a second, but first a little about Shiny Side Up. Like car collecting, bike collecting is a niche activity. If you’re into the old Schwinn balloon tire bikes and “chopper” bikes, southsydecycles is the place for you. 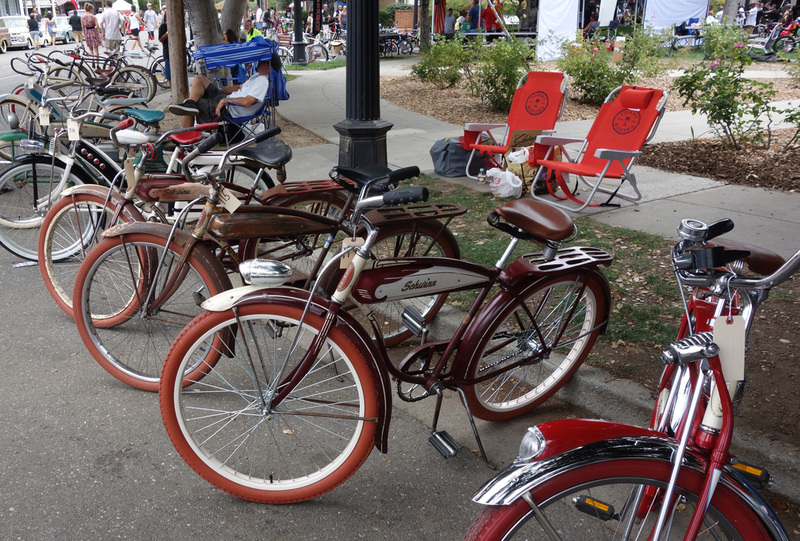 Schwinn made millions of single-speed town bikes, and it looked like every one that’s left was on display in the park. My parents couldn’t afford a name-brand like Schwinn so we kids got the J.C. Higgins Flightliner, circa 1960, sold by Montgomery Ward. 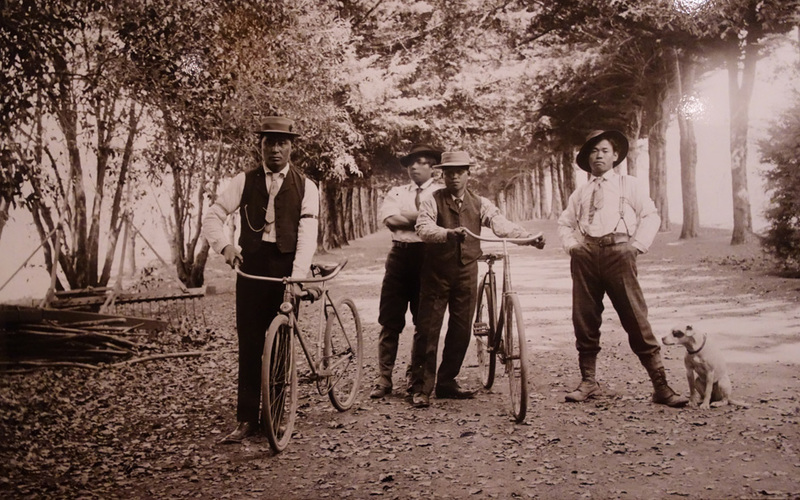 Now let’s take a look inside the Arbuckle Gallery and see what’s in store for cycling history aficionados. 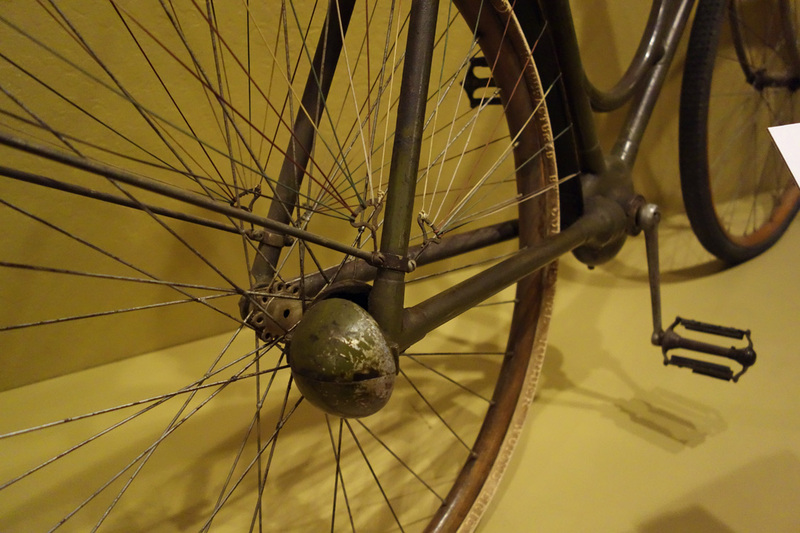 There’s a lot of history packed into a small area, starting with the earliest bike on display, a velocipede (a name coined by the French) built in the mid-1800s. These bikes with steel rims were aptly nicknamed boneshakers. Beautiful photo on display in Arbuckle Gallery. In my mind, bicycle design took a step backwards with the big-wheel penny farthing in later years, mainly because they were so difficult to ride, mount and dismount. The first safety bikes that looked and worked like today’s bikes are also on display, including one of my favorites — the bike without a chain. Instead of a chain, it has rear-stay direct-drive geared shaft. (Check out the wood rims.) There’s a modern version of this bike. I don’t imagine it sells all that well, but if you really don’t like chains, it’s a decent option. No more chain. Drive- shaft technology. There’s a display case devoted to Clyde Arbuckle, who by all accounts was a walking encyclopedia of San Jose history in later life (1903-1998). He was, in fact, the city historian. But more importantly, he was a cyclist and winning bike racer in his youth. Sadly, I never had the opportunity to meet him, or his son Jim, who died while cycling, age 72. There’s also tribute paid to Spence Wolf (Cupertino Bicycles), Ellen Fletcher (Palo Alto City Council), and John Forester (bicycle transportation engineer). I did a two-hour video interview with Ellen about her life a few years ago that I hope to post. 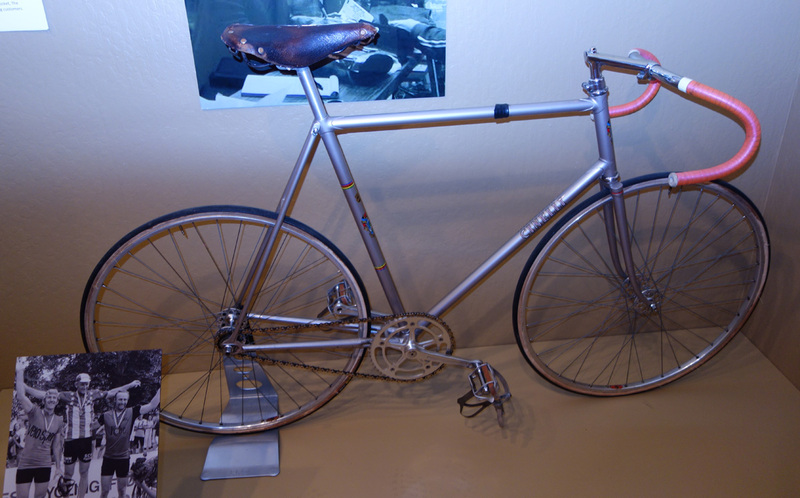 You’ll see some interesting bikes from the past, including a classic Cinelli track bike in pristine condition, and of course some mountain bikes, which were popularized by cyclists in Marin County and, to some extent, by South Bay riders. The real reward for showing up on opening weekend was encountering cycling acquaintances who have seen their passion evolve over the past four or five decades. I talked with Chris Dresden about his recovery from a heart operation, and Ken Kratz, retired Santa Clara traffic engineer who helped design the San Tomas Aquino Creek Trail. Our paths had crossed years ago at work and while I was on the Santa Clara bike committee. Trophy case for San Jose clubs going way back. 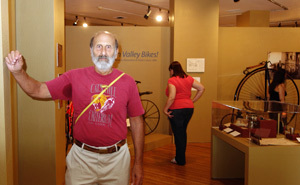 Finally, one of the co-curators of the bike display, Terry Shaw, walked around chatting with attendees. The retired owner of Shaw’s Lightweight Cycles in San Jose (1976) and Santa Clara (1984) had a heart transplant in 2011, as reported in the San Jose Mercury News, and says he is back riding and feeling great. He sure looks it! Among pro bike shops, I could depend on Terry to have those rare parts that riders need for older bikes. But unlike some, Terry also catered to the regular bike crowd. One time he sold me a set of nice alloy rims for a beater 3-speed. He was the only shop owner that had alloy as opposed to the standard steel rim. Now there’s someone who appreciates all bikes. Terry Shaw put his considerable knowledge of cycling history to good use. Terry said that this display is just the beginning. He hopes that it can find a permanent home and continue to grow. That’s a worthy goal, considering the rich history of cycling in the Bay Area. Many of the bicycle inventions and trends of the 1970s-2000s have been here. The riding isn’t half-bad either. This entry was posted on July 27, 2014 at 7:12 pm and is filed under History. You can follow any responses to this entry through the RSS 2.0 feed. You can leave a response, or trackback from your own site.